The appearance and substance of Crossley ID Guides are unique, innovative and revolutionary. 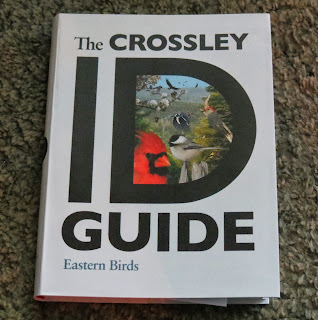 Produced by once partner-in-crime of mine on Scilly - Richard Crossley - now residing in the USA at Cape May - it is the first guide to feature photographs with a backdrop of natural habitat - in all over 10,000 of the author's photographs being utilised in this remit. It is an interesting approach and will have its lovers and its haters. For me, I was more interested in its narrative and its ability to help in one's goal of field identification. 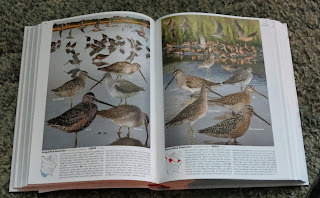 I was pleased to see an array of plumage differences included for each individual species entry and even more pleased to see the author largely follow the PSC rather than the more traditional BSC used in most field guides although rather disappointed to see the lack of treatment (or images) given to the generally accepted 14 forms of North American Canada Geese and virtually nil discussion nor images of Melville Island Brant. American Black Duck could have benefitted from being given more treatment of hybrid forms and overall, general lack of space offers little chance of realistic identification analysis on any species on any individual page. However, I like the idea, found it pleasing to the eye if not a little jumbled and a welcome addition to the New World library. Redpoll taxonomy seemed confusing and I was not entirely convinced of the identification of the claimed exilipes redpolls in the plate on page 483 nor of many of the so-called Common Redpolls - but redpoll taxonomy overall is confusing and a nightmare in itself anyway. Overall, the general quality of Richard's images were superb (particularly raptors, waders and New World warblers) and certainly well chosen and his tips on identification to the point, accurate albeit brief. Distribution maps too seemed accurate and current. Creating a digital montage of shots like this is not to everybody's tastes and against such a busy backdrop of lakes, sea, fields, mudflats and hedgerows, you could forgive one for being overwhelmed by this guide. Whether or not these same images would work better on a plain background I do not know but Richard should be applauded for breaking out into such new ground. It is certainly a gamble but overall, this is a classic guide - incredibly useful as an identification aid. I personally found the Kingbird pages most useful, allowing the browser an opportunity to study the more salient features at close range, whilst sexing hummingbirds was made far easier with such images.